For the second consecutive year, the Stanley Cup Finals will feature a first-time combatant. Last season, it was the San Jose Sharks that represented the one-time Clarence Campbell Conference. For the Sharks, it was their first trip to the Championship round since joining the NHL ranks in 1991. Last night, the Nashville Predators– members of the NHL since 1998– defeated the Anaheim Mighty Ducks by the final score of 6-3 to advance to their first trip to the Finals. ....and, with any luck, YOUR PITTSBURGH PENGUINS will repeat history as well by earning their way back into a seven-game set to determine the 2017 Stanley Cup championship by defeating the annoying dogged pesky Ottawa Senators later tonight. 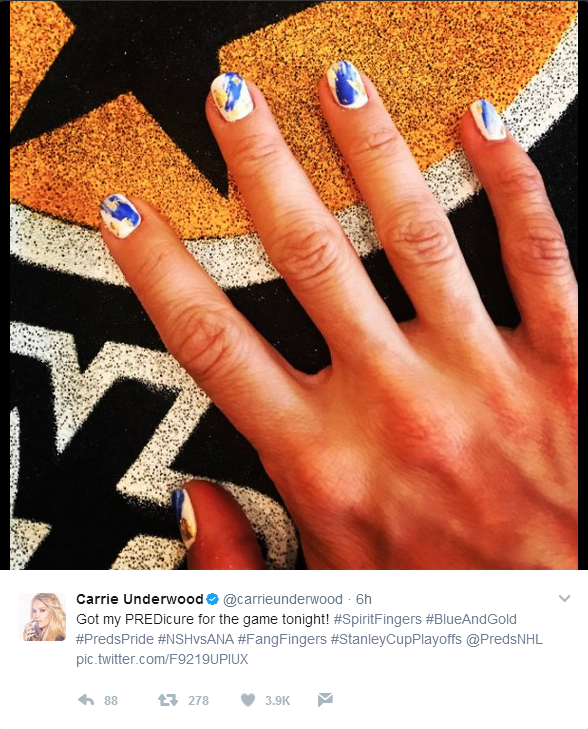 I mean...dammit, even her hands are gorgeous. -the Predators traded former Captain Shea Weber to Montreal for PK Subban, whose great flaw for the Canadians was...let's just say "Les Habitants" didn't appreciate his, uh, goal celebrations. ...but you'll be awfully hard-pressed to find anyone in the Montreal media that isn't willing to at least discuss the racial angle in the Subban/Weber trade.. I mean, you can always make the BIGGEST MISTAKE EVER and read the comments of the above article and find plenty of PALM-YOUR-FACE fodder, but seriously, don't. Don't. While I'm not a fan of the hack & slash game Subban plays– OH HAI MARC METHOT– I became a Subban lifer after the abuse he took from Boston Bruins fans (and Boston fans are once again under fire for being racists) during the 2014 playoffs. ...and seeing Subban make the playoffs while the Canadians (and hopefully the rest of C-eh-N-eh-D-eh after tomorrow) watch the Finals is just delicious. As for the Game 6 highlights, well...let's just say that the Anaheim Mighty Ducks goaltender Goldberg Jonathan Bernier had basically none of them. Bernier allowed 4 goals on 16 shots (that's an .800 save percentage for those of you scoring at home AND I KNOW YOU ARE! ), and most of the goals allowed were of the SO AWFUL THAT YOU BARELY NOTICED THAT I GAVE HIM A HIGHER SAVE PERCENTAGE THAN HE ACTUALLY DESERVED variety. Bernier was so brutal, and so obviously fighting the puck, that the Ducks' coach, Randy Carlyle, deserves to have his feet pressed to the fire. JUSSSSSST KIDDING!!! 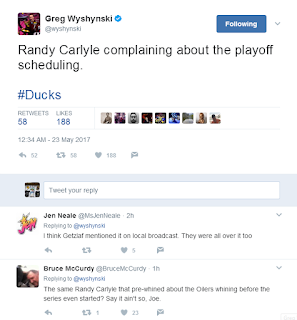 HE BLAMED IT ON THE NHL AND THEIR SCHEDULING! "Excuses:" It's not just a bar on the South Side. THEIR WINGS ARE FANTASTIC! I mean, nevermind the fact that the Ducks' schedule would have been a lot more favorable had they won their previous series in fewer than 7 games. Not the NHL's fault was Ryan Getzlaf being fined $10,000 for using a homophobic slur. Nor was it the NHL's fault that some Anaheim Mighty Duck fans took it upon themselves to start a "Go Fund Me" to help Getzlaf cover the cost of said homophobic slur. And then the Ducks' Nick Ritchie boarded Viktor Arvidsson and was given a 5-minute major and ejected. And then, just in case you were STILL inexplicably rooting for Anaheim...Ducks' defenceman Kevin Bieksa decided to go all "message sending" by attacking any & all Nashville players within his range during the final 6 seconds of a 6-3 game, elimination game. ....I just respectfully hope that you lose in the finals to the Penguins. Is that too much to ask? Good luck to the boys in black & gold tonight versus the Senators in Ottawa!